Day 3 started fine, warm and sunny. An altogether nice day. I did a little painting in the morning, then headed out for some meetings and lunch and back again in the early afternoon. 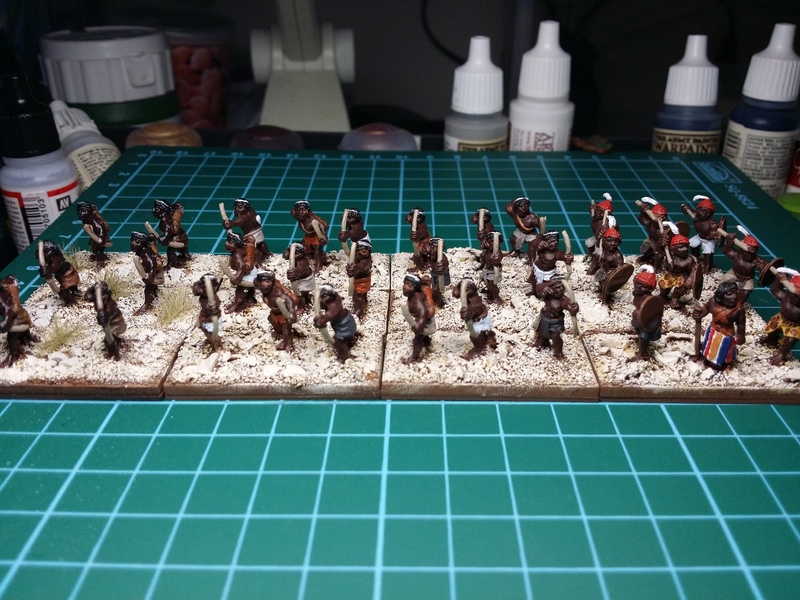 Today I got the block colours done on the rest of the figures, although I still need to do the shields on the warband. Fear of leopard skins had me madly searching this morning for various large animals that roamed the area occupied by the ancient Nubians, at the same time as the ancient Nubians were around. Apart from leopards, there were lions, oryx and various antelopes mercifully in single shades. The colours of their pelts ranged from white to almost black with a few shades of “Frasier Browns”1 thrown in for good measure. I painted various browns. Some white was added for the headband and arrow flights (the flights will appear grey when finished), bow, arrows and quivers painted and hair painted. 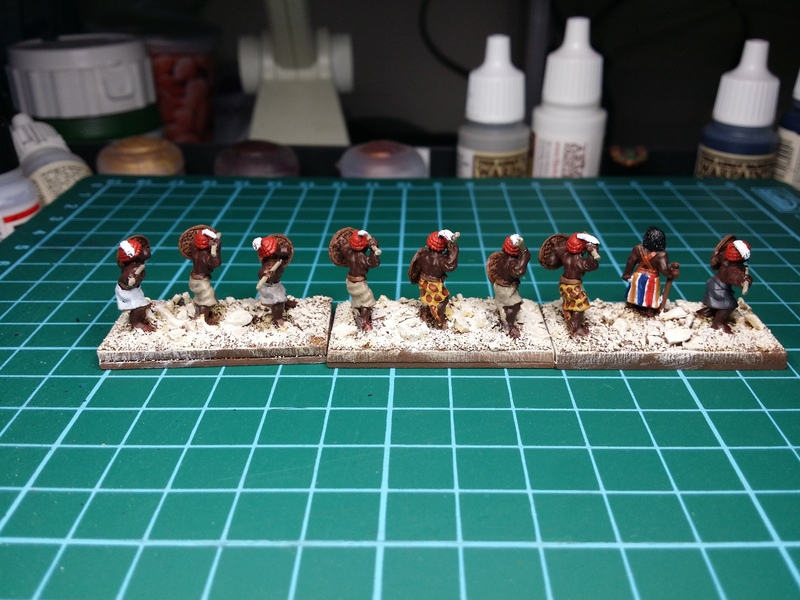 For the warband I mixed some red and brown to give a kind of natural red hat for the warband. Bird feathers are white. For the chief I saw an illustration with a number of Nubians and one was in a long tunic with coloured strips on it. I ignored the fact that the illustration was a female and went ahead and gave the boss stripes. My interpretive attempt at a 15mm leopard skin … well, I ain’t no Rembrandt! Niles: That’s going to be hard to get used to. looks good mate. For leopard skins, when I have painted them in the past, I have gone a much paler yellow, then the dots going from large to small, and then fading the yellow into off-white. It’s pretty easy to do, and looks great when it works. Black wash went over the feathers at lunch today … need two washes tonight and a little dry brushing then the #£«$¿* leopard skin some more. Add some scrub to the base and varnish. I should think about a camp I suppose … maybe. Trying to decide whether or not to keep dark brown base sides.